COVINGTON, Ky. — As crews prepare to treat roads throughout the Tri-State for another wave of wintry weather this weekend, some commuters still haven't seen their paths to and from work cleared after last weekend's snow storm. Commuters like Aaron Martinez, of Ludlow, use the walking paths affixed to the sides of the John A. Roebling Suspension Bridge on his daily walk Downtown to his place of work. He said since Saturday's snowfall, he's had a slippery walk to and from work. "I think they should treat the sidewalks same as they do the streets," Martinez told WCPO. 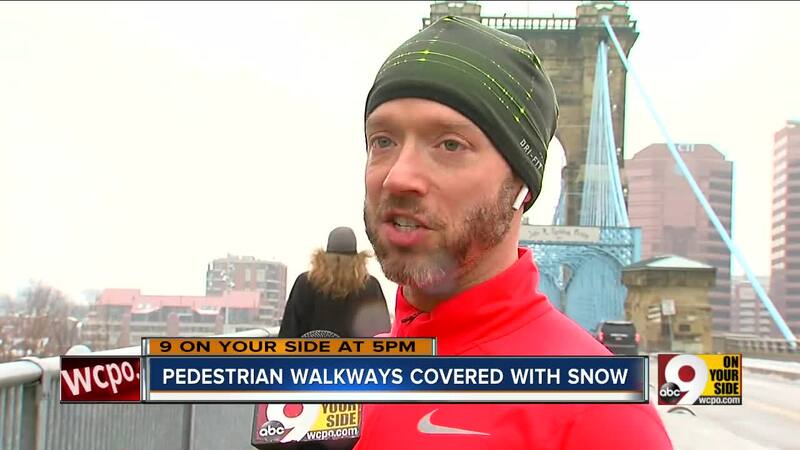 Marathon runner Christian Meadows also runs the 1,000-foot span every morning -- even in the winter. He said the uncleared sidewalks made his morning ritual a challenge. "It was difficult. I actually slipped coming around one of the turns because it was ice still," he said. RELATED: Who's supposed to clear sidewalks when it snows in Cincinnati? The Roebling Bridge -- along with the other five bridges connecting Cincinnati and Northern Kentucky -- are owned and maintained by the Kentucky Transportation Cabinet, along with the other state routes winding through the Commonwealth's northern counties. The KYTC handles the Northern Kentucky-side approaches to the bridges and the bridge spans themselves, but not the approaching roadways and sidewalks on the Ohio side of the river. KYTC District 6 spokeswoman Nancy Wood said her department doesn't have the personnel or resources to treat sidewalks in addition to the hundreds of miles of roadway. "Normally, we just don’t have the manpower to address those," Wood said. "Our focus is on the roadway. We don’t clear any sidewalks on any of our state roads." Wood said the cities -- namely, Newport and Covington, when it comes to bridge clearing -- sometimes chip in with roadway clearing, but those resources are limited, as well. "Sometimes cities where there are different jurisdictions, if they had the time, they might go out and throw some salt, try and maintain some of it," she said. "But with our workload and capacity, especially during snow and ice, that is not the main focus."